The Nashville Predators are done dealing with the speed of Nathan MacKinnon and the Colorado Avalanche. DENVER — The Nashville Predators are done dealing with the speed of Nathan MacKinnon and the Colorado Avalanche. Next, they get the physicality of Dustin Byfuglien and the Winnipeg Jets . There's no easy test this time of year. "They've got size. They've got skill. 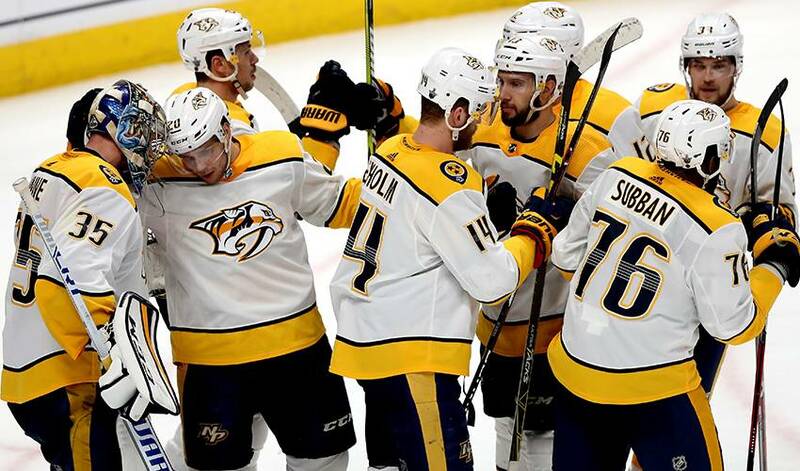 They've got speed," forward Austin Watson said Sunday night after Nashville beat the Avalanche 5-0 in Game 6 to clinch the series. "Get our rest and get prepared." Nashville looks every bit like the team that went to the Stanley Cup Final a season ago and won the Presidents' Trophy this season. The Predators are hitting their stride heading into the Winnipeg series. They had 11 forwards notch at least a point in the Colorado series. Not to be outdone, the Jets had a balanced scoring attack in closing out Minnesota, 4-1. "We saw how the regular season went against them. They're good hockey games," said Watson, whose team went 3-1-1 against the Jets during the year. "We're excited." This goaltending showdown should be worth the price of admission: Pekka Rinne vs. Connor Hellebuyck. One Vezina Trophy finalist against another. Both are coming off a solid series, with Rinne stopping 22 shots in a 5-0 win Sunday to close out the series with Colorado. Hellebuyck had a 1.94 goals-against average in eliminating the Wild. "Moving into the second round, I think you want to be playing very good defensive hockey against Winnipeg," Rinne said. "One of the better teams in the league. They have a lot of firepower, a lot of talent up front. Also, like ours, their 'D' is a big part of their game. I think it's going to be very exciting, good series." The Western Conference semifinals feature a little bit of history: This marks only the third time the final four in the conference are all chasing after their first Stanley Cup since the introduction of conferences in '74-75, according to information provided by the league. The scenario also occurred in 2012 (the Los Angeles Kings hoisted the Cup) and in 1984 (Edmonton). In the other semifinal matchup set to get underway, expansion Las Vegas faces San Jose. "Anytime you win a series you're feeling confident," Predators forward Nick Bonino said. "We're going to be as confident as we can going against Winnipeg. We know how good they are." That's a sentiment shared by forward Filip Forsberg, who scored four goals against Colorado. "It was a good test for us. These guys have been flying around for six games, playing really fast hockey," Forsberg said. "We've been trying to play as fast as we can as well. If we can bring that speed into the next round that will be good." The Nashville defence will have its hands full with the likes of Jets forward Patrik Laine, who scored 44 goals in the regular season, and Blake Wheeler (91 points). Still, the Predators enter on a high after posting a shutout victory in a series-ending game for the first time in franchise history. They joined Vegas and Winnipeg as the third team to accomplish the feat this post-season. "It's better to end it this way than hanging on at the end," Predators coach Peter Laviolette said. "There are other teams on the ice that are pretty good hockey teams. You see it in other series going on. It would have been great if you win (the series) 4-0 but that wasn't the case. We had an opposition that was young, skilled and fast and they had nothing to lose, and they played that way. There were times in the first five games it didn't look like it was just going happen — we were going to have to work for it. "It was nice tonight to play a game we were comfortable with." The Avs take some pride in knowing they gave the Predators fits at times. "We made them fight for it," Avalanche captain Gabriel Landeskog said. "The way Colorado works and battles and plays the game fast, it definitely challenged us," Predators centre Colton Sissons said. "It was a good experience for us going forward."